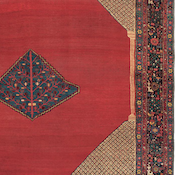 The village of Karaja is known for its identifiable geometric rug design that shares some of the traits of other weaving from the East Azerbaijan Province of Iran, including Heriz, Serapi and Bakshaish, while adding distinctive elements of their own. 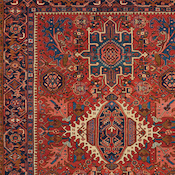 Their artistry, handsome palette and durable weave make them a wonderful addition to the pantheon of Persian Rugs. The remote village of Karaja, or Qaraje, is located roughly 35 miles northeast of Tabriz, is now the capital of the East Azerbaijan Province. 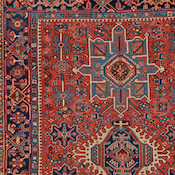 This area is not only well known for its vaulted history as the birthplace of the iconic Persian Carpet, but also producing an amazing number of unique and treasured weavings. The weavers of Karaja, along with their better-known neighbors from Heriz, have excelled in tirelessly producing beautiful yet sturdy weavings whose raison d’être is to be enjoyed and used on a daily basis. Click to learn more about this luxurious home theater. The classic iteration of the Karaja is an area size rug with a central diamond or hexagonal medallion, with varying degrees of artistic interpretation, but consistently surrounded by an eye-catching latch hook motif. Two flanking medallions, usually resembling the classic eight pointed Heriz medallion, complete the triad. These impressive designs are set among angular vines and other geometricized floral motifs in fields of brick red, indigo, or rusty amber. 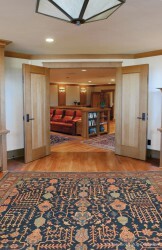 Though Karaja rugs are not as ardently defined by their colors, they typically appear in similar hues. 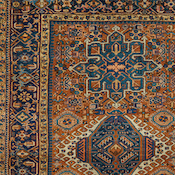 The specific number of medallions is typically based on the length and shape of the rug. 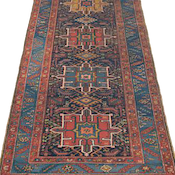 Most Karaja rugs tend toward area sizes and runners. The occasional room size carpet will combine parallel rows of these repeating medallions upon a soothing madder red or dramatic indigo field. The Karaja runner is an excellent choice for the busy, modern hallway, being both artistically expressive and resilient to wear.  The same can be said for an area size in a highly trafficked location such as an entryway. 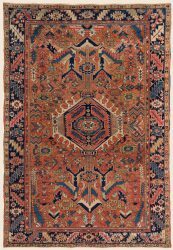 The weavers of Northwestern Persia have produced numerous beautiful rugs that have created a lasting impact within the antique rug trade. 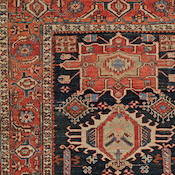 Karaja rugs are a handsome addition to that lineage and display a delicate balance of influences from the surrounding cities and villages. These weavings will continue to be revered for their individual artistic character, coupled with their robust and long serving craftsmanship.